For any runner starting out in downtown Palm Springs, the smoothly paved bike paths in the city center are a dream come true. 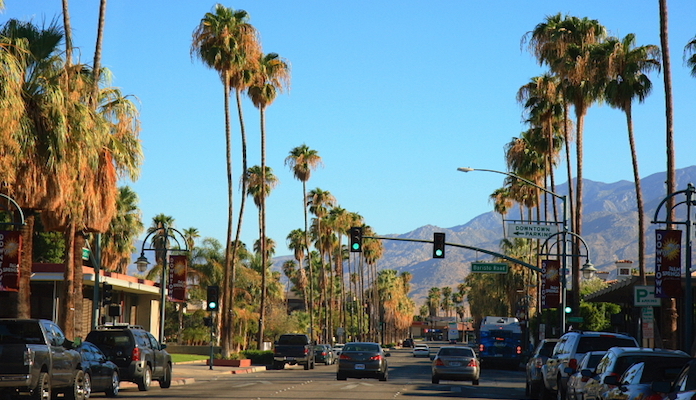 This route is situated within easy distance of most Palm Springs hotels, and covers an always interesting route through parks and tourist attractions like the whimsical Robolights amusement park. We’ve put together a 6-mile tour of downtown’s highlights, with not too many turns on the grid-like street pattern. Start out heading south on the sidewalks of Indian Canyon, then hop on the bike route which connects to Ramon Road. Follow the path until it connects to Sunrise Park, where another bike lane runs along the north end of the park, connecting Baristo to El Cielo. Once you reach Tahquitz Canyon Way, you can run along the main bike path until you hit Sunrise Way, which will bring you north to Alejo. Here, take a detour past the bright lights of Robolights before returning to the start via Alejo.